Now, I am sure the entertainment value for those not crazy about BCS would increase greatly if Jimmy would turn to Saul and let all the wild antics ensue. And Season 2 has given us hints that the transformation might be sooner rather than later. Jimmy and Kim conned a guy in the very first episode. Episode 2 featured the “Hoboken Squat Cobbler” and it seemed like Jimmy was in a dead sprint to get to the persona we all know is his destiny. But now Jimmy is on his own. No more Erin the Babysitter looking over his shoulder or Chuck questioning the ethics of Jimmy’s methods. After too many episodes as a proper lawyer, Jimmy appears ready to really establish himself as the top shady attorney of Albuquerque. The forging of documents at that 24 hour copy store (and let’s not forget the public masterbator pretending to be a World War II Vet) moved us a large step closer to Saul Goodman. Now Jimmy wasn’t the only one taking a giant leap to his future self. 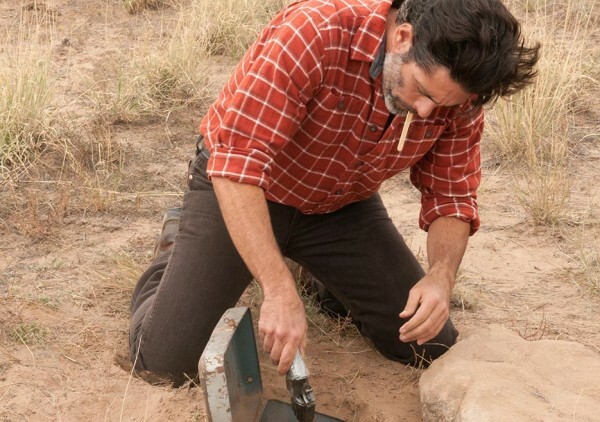 Whatever contraption Mike just created is unlikely to be a half measure as he deals with Hector “I’ll be having a stroke real soon” Salamaca for spying on the wrong granddaughter. And what the hell is up with that damn ice cream truck? That will not be the first time I ask that question in this recap as we start with the most pleasant resignation meeting in the history of resignation meetings. I did not expect this meeting to be so pleasant. It’s like Howard takes a poll before each episode to determine how we feel about him, and then goes the opposite way. He’s the heel all of Season one, only to be redeemed at the end of the season when it’s revealed that Chuck is the one behind Jimmy’s misery. But then, the guy moves Kim downstairs for second time and kept her there despite her landing a huge client. So I really expected some fireworks at this meeting. But not only does Howard wish her the best on her way out of HHM, but he also waves all previous law school debt that Kim owed the firm. Let’s us figure you out already Howard!!! It’s worth noting here that Jimmy wanted Kim to be sneaky about her resignation, but I doubt she gets her law school debt cleared doing it the “Slippin Jimmy” way. Kim (Rhea Seehorn) and Howard (Patrick Fabian) saying a pleasant fair well. But Kim overhears the call Howard request his assistant to make before Kim has even left the office. He wants to set up a meeting with Mesa Verde, so Kim races to what is still her office and sets up lunch with Paige and Kevin to try and sure up their support for her new practice. Though she’s not signed them on officially, Kim is convinced that her meeting went very well and that Mesa Verde is going with her. She’s so confident that she tells Jimmy to go ahead and get papers written up to rent a nice new office for their partnership. But HHM have something up their space blanket wrapped sport coat sleeves. Though their styles are drastically different, Chuck proved this episode that Jimmy is not the only slick salesman in the family. Funny how a guy (Jimmy and Chuck’s father) with so little acumen for swaying others could produce two sons who are extremely adept at it. 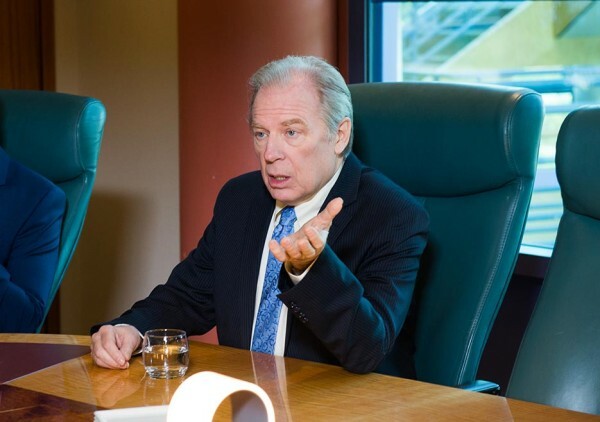 Chuck (Michael McKean) making his pitch to Mesa Verde, encouraging them to stay with HHM. Chuck decides he must go to the office and risk all the electromagnetic waves in order to keep Mesa Verde as a client. So he gives the pitch, which first praises Kim’s ability as a lawyer before Chuck mentions random laws that Mesa Verde will have to be in compliance with if they want to establish a new branch in Scottsdale. Look at Chuck casually dropping bank law bombs!!! He could probably make one up and throw it in there for good measure and I doubt Paige and Kevin would even notice. But that’s more of a Jimmy thing, so I think we can assume every law quoted here exists. Chuck claims that Kevin and Paige need a team to handle all of these obscure banking laws and the pitch works. But so long out in public was not good for Chuck and his “condition,” a situation Jimmy takes full advantage of later in the show. Free of the constraints placed on his creative juices by Davis and Main, Jimmy takes his usual film crew out to an army base to look at an old plane that was used to during World War II. 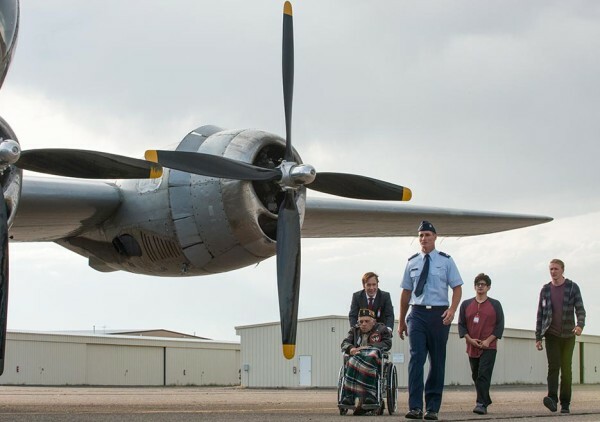 They claim the man they are pushing in the wheelchair is a former general, Major Theodore “Fudge” Talbot, and he wants to see that plane (which is named Fifi). Jimmy and his film crew approach Fifi, a plane used in the Pacific during World War II. But of course, the “Major” is not anything of what Jimmy says he is. He’s actually a guy Jimmy represented as a defense attorney when he faced charges for “public masturbation (another real winner Jimmy represented as a public defender).” They ask the soldier who leads them out there to get the “esteemed major” a bottle of water. While he’s doing that, a miracle happens!!! The Major can walk!!! Praise the Lord, the man can…well of course the man can walk. Jimmy gets images of Theodore standing in front of the plane in his army gear. In the middle of taking the images, Jimmy receives a call from Ernesto, the man whose been assisting Chuck since Jimmy stopped doing it. Chuck is in really bad shape, and Jimmy makes plans to go check in on his brother. Kim takes the loss of Mesa Verde hard. When Jimmy sees her next, she’s having second thoughts about their whole plan and whether they should really be trying to rent the nice office they were looking at early in the show. 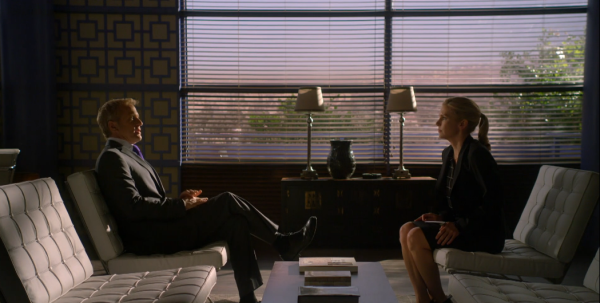 But Jimmy convinces her that he has faith in their operation even without a big client to open with. The two go in an sign the lease papers for the office, then Jimmy goes to see Chuck. Now, I personally think Jimmy had this planned the moment he heard Kim lost Mesa Verde to Chuck. He goes to comfort his brother, but Chuck is barely conscious. Jimmy sees the files for Mesa Verde sitting in Chuck’s house. I don’t think Jimmy last season would’ve had the conscience to do this to his brother. But we know how there relationship has changed since then. Tonight’s felony: forgery. Jimmy carefully looks through the files, making several notes. He then heads to a 24 hour copy store and begins chopping up the files. The key change involves the address. Mesa Verde’s planned expansion is at 1261 Rosella Drive in Scottsdale. Jimmy cuts out the 6 and the 1, reversing it in every document the address appears so it reads “1216 Rosella Drive” instead. While Jimmy was forging documents, Mike was being his awesome self. And what’s crazy about that is it’s not like he did anything major tonight. But the anticipation of what he’s about to do is tense even when the things he’s doing don’t seem like they should be. We see Mike again in the same place we saw him last episode: spying on Hector and his crew at the store/restaurant they do business. An ice cream truck pulls up and makes a delivery right before “ding ding” arrives. And that was the same ice cream truck we saw at the start of the show going across the US/Mexico border. Nobody does an opening montage like Vince Gilligan and crew. I’m not even sure where they find the music for these scenes, but it’s usually perfect. The truck driver pulls into the garage at the border and gets everything checked by the customs agents. They find no issues and the truck is allowed through. After getting into the US, the truck driver pulls off the side of the road and goes to a randomly placed rock that is hiding a gun. He grabs the gun and puts a popsicle stick (one of many that have been placed there) into the ground. In other words, this is a routine activity in the Salamaca operation. The Ice Cream Guy finds a gun in the desert. Next time we see sneaky Mike, he’s tailing Hector at a garage somewhere. And the ice cream truck arrives there. I’m sure the drug dealers just like to have a stash of Rocky Road around when they get hungry. The truck pulls in and the door closes behind it. Our final scene with Mike is him working with Kaylee drilling holes in a water hose. A nice touch here having the person this device is helping protect help to create the device. When Stacey comes by to get Kaylee, Mike says it’s for his garden. Now, none of us watching believe that for a second. The final scene of the night is Mike putting nails into each of those holes him and Kaylee drilled through the water hose. I think we can safely assume one part of Mike’s plan is to get that ice cream truck or another vehicle to role over those nails. What step in Mike’s plan will we be privy to next week? 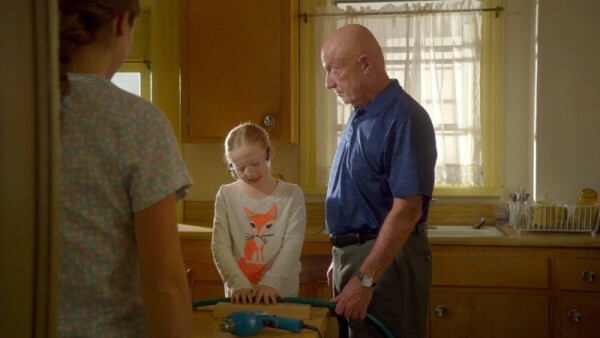 Kaylee helping Granddad make a weapon to take out a druglord. -Their partnership less than a a day old and Jimmy was already telling Kim to be sneaky about her resignation. This whole “you do it your way and I do it mine” dynamic will interesting to follow. -We got a little background into why there are two H’s in HHM. And maybe it was just me, but Howard seemed a little jealous of Kim for getting to go out on her own while he’s still stuck holding up the fort at HHM. I wonder if we will get any Howard flashbacks at some point in during the show. -All Chuck needed to overcome his “condition” was the drive to beat Jimmy. I know Jimmy can sound paranoid the way he blames everything on Chuck, but I do think he’s right about this. -I am curious as to why a bank needs so much legal representation to get one branch built in the same state it’s already in. Maybe someone out there with banking expertise can answer that for us. -I wonder if that one guy who saw Jimmy do all that work with those documents had any inkling as to what he was up to. -The Doghouse, the hot dog stand where Jimmy and Kim are eating at the start of the show, is the same place where Jesse bought a gun back in season 2 to protect himself from Tuco. It’s also referenced several times as a place where many drug deals went down before Jesse started working with Walt. Jesse sitting at the Doghouse in Season 2. -Did anybody else think the location of that garage looked a lot like where Walt and Jesse met Tuco at the end of season one/start of season two? -How will Kim react to Jimmy doing things “his way” to get her one of her clients back? -How quickly will HHM learn that Jimmy is responsible for changing those documents? -What is Mike’s ultimate plan to get his revenge on Hector for his threats to Kaylee? -And what the hell is inside that damn ice cream truck and where are they hiding it? On a side note, did anybody else turn on Villanova and North Carolina after watching BCS? I was writing part of this review while watching it, so if you notice any mistakes, let me know. I may have been distracted by that amazing finish. Previous postUPDATE! Volumes of Blood: Horror Stories Teaser + VoB Blu-ray Release News!